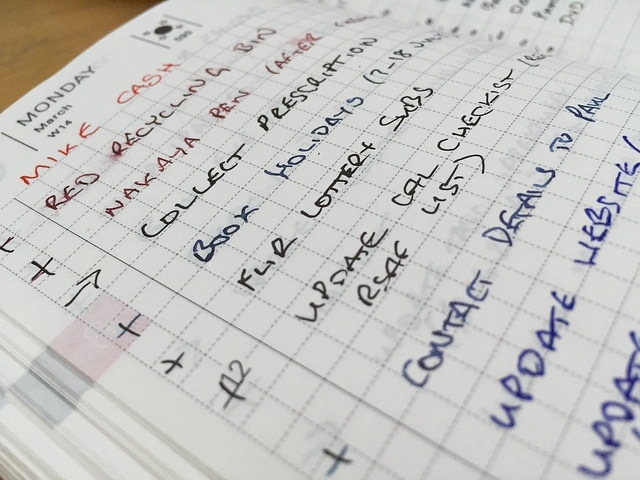 Way back in late 2014 I wrote about my first year using a Hobonichi Techo planner. This year, as I ordered my fifth Techo, I thought it was interesting that since 2013 I’ve switched around a few software task manager applications — Omnifocus, Things, 2Do etc — but the paper (or analogue if you prefer) planner has stuck with me. That thought, and a discussion on Twitter, prompted me to reflect on why that paper-based workflow has worked so well over the last four years. What is the Hobonichi Techo? 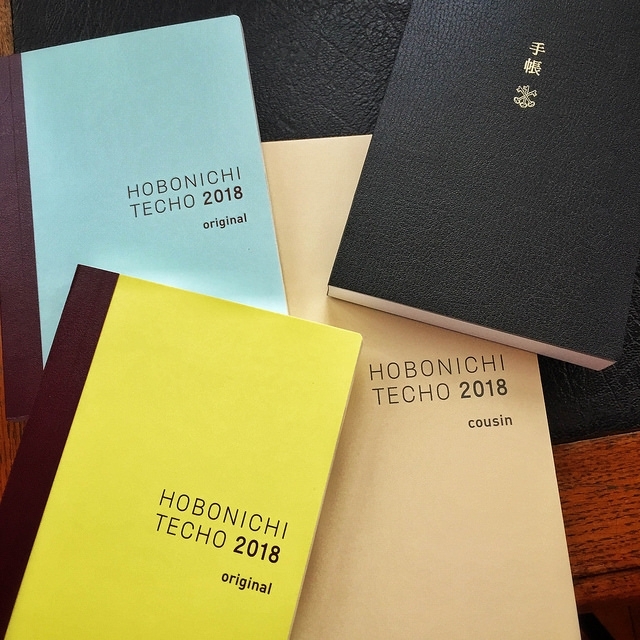 A Hobonichi planner is a “a popular Japanese brand notebook/daily planner manufactured by Hobo Nikkan Itoi Shinbun (Hobonichi).” One aspect that undoubtedly helps that popularity is just how well-designed the Techo planner is. It’s small (A6), folds completed flat when open and uses beautiful Tomoe River paper — a very thin and fountain pen friendly paper — giving you a page-a-day in a thin book. The book is arranged in four sections; a calendar with four months across two pages, a month calendar, the page-per-day planner and an information section (this year it includes a guide to Japanese tea and sweets). I barely use the calendar sections, although they’re a handy place for an overview of things like school holidays, birthdays and fun to colour-in with holidays! Next year I may use them as a record of the fountain pen and ink combination I am using each day. 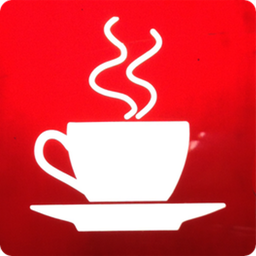 In the English language versions, other than a divisor between morning and afternoon, the page-per-day is essentially blank, providing a free-form way to plan your day. I say essentially because each page also includes a quote specially selected from the planner’s parent site, Hobo Nikkan Itoi Shinbun. I could quite happily live without these — some users might find them whimsical; for me they’re generally an irritant! You may also choose to buy from a vast selection of different cases and covers available for the Hobonichi Techo but I carry mine in a beautiful oak bark tanned leather cover made for me by John Hagger of Tanner Bates in Devon. Each year since 2013 I have ordered a Techo in September and sat down and started to fill it in sometime during December. Those first entries are fixed events1 such as birthdays, and reminders to buy birthday and anniversary cards, tasks that repeat regularly and long-term tasks that I carry over from my current planner. I dedicate blank pages at the back of each planner to things like renewing passports; these are tasks that have to be tracked years in advance. The planner also includes blank ‘up next’ pages between each month that allow you to quickly include tasks for the next month without needing to think about when in the month they occur. As I start a new month I read through that list and then plan tasks in more detail. At some point it struck me just how closely this follows the ‘tickler file’ structure outlined by David Allen in his Getting Things Done2 methodology. There are up to 31 pages in each month, 11 ’up next‘ pages plus one long-term page making 43 folders! I still track tasks using a variant of Patrick Rhone’s ‘Dash/Plus’ metadata markup system that I described in 2014 . My planner gets most use at work where it sits open in view, behind my keyboard, and I can see my tasks for the day, any events and very quickly add new tasks. This year I have started using a daily bar to track what projects I’ve spent time on each day and that has proved really useful in ensuring I book my time accurately. I don’t carry my planner everywhere with me — while it’s small, it’s not that small— so I find it useful to use a task management app on my phone at other times. At the moment that app is Things by Cultured Code, the application that has come closest to my ideal3 in recent times. There’s a certain redundancy in using two different tools to manage tasks, but it seems to work well for me. I can capture ideas into Things using Siri wherever I am, schedule them, and transfer them to my planner later if needed. I will review my Things ‘today’ list each morning at work and there’s a certain pleasure to be had marking a task as done twice! I use my planner much less outside work, and this is where Things is really useful. I always have my iPhone with me, and I can use Things as a tool to capture and store ideas as well as tasks. I think this paper-based system has worked well because it is simple. Tasks can include as much or as little information as required, there is no feature creep needed to align with the user experience design of an application. I can glance at my tasks; there is no need to open an app to look at a to-do list and I can simply note down a new task while doing other things, even while using my iPhone. For 2018 I have decided to experiment with the form factor of my Hobonichi. I may stick with the classic A6 size or may go bigger or smaller, I haven’t decided yet. Alongside the English Techo I have ordered the larger A5 ‘Cousin’ size and the thinner ‘Avec’ size that are A6 but only cover six months with two books covering the year. So, in essence, I’m going deeper with using a paper-based planner for 2018. I will be interested to test whether I can either do more with a larger book or am more likely to carry the thinner book with me more frequently. There will also be the challenge of whether I can use the non-English version of a Hobonichi but then that also means …no more whimsy!